Guest presentations on a range of topics across science, technology and energy policy. I’m an engaging and experienced speaker, and I’m able to pitch my presentation to any audience, technical or general public. Talks and demonstrations of food science. I can host a stall on “Beer and BBQ” (demonstrating how to cook the perfect steak with a bucket of water and a blow torch), give a talk on how science is helping us cook better, or demo a range of exciting new cooking methods (ala Heston Blumenthal!). An entertaining after-dinner speaker, providing anything from a light-hearted look at what all industries can learn from movies about scientists, to inspiring your guests with the cutting edge of science, to an interactive game show featuring your favourite guests. Since 1999, I have been heavily involved in science communication. 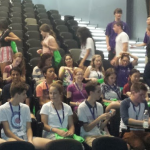 I eventually co-founded the award winning UQ Physics Demo Troupe, a group of performers who travel Australia doing science shows and workshops with schools and the general public. Since then, I’ve featured on Catalyst talking about food science, had a weekly segment on a kids TV show, presented on black holes to the Mayor of Charleville in outback Australia, worked with students in countries ranging from Kenya to Bhutan, and been a regular speaker at National Science Week events. I have presented a number of public lectures on topics ranging from black holes to climate change to food science and molecular gastronomy. 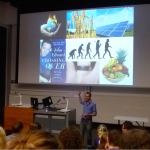 I’ve recently been giving quite a few talks on food science, looking at how science is helping us understand how we cook now, and how we can cook better in the future! I’m currently filming a new series of TV show Food Lab – looking at some of the science that underpins our tastiest foods! I love talking to both school students and teachers, and have been the guest speaker at a number of teacher conferences. I can also organise a variety of “light entertainment” activities for an end-of-year evening dinner! I have an honorary position at the University of Queensland, where they give me liquid nitrogen in exchange for public lectures and hosting (an excellent deal for us both). 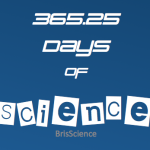 For many years, I was one of the organisers of BrisScience, a series of free public lectures on cutting edge science held in Brisbane, and I’m now their regular MC.